Dry risers should be inspected visually every 6 months and fully tested annually to BS9990/2015. Call today 1800331100 to ensure your building complies. A Dry Riser is a system of valves and pipework which enables the Fire Brigade to pump water on to the upper floors of a building. All buildings between 18 metres and 50 metres are required to have a dry riser system installed. The dry riser pipe is maintained empty of water. All building over 50 metres are required to install a wet riser system. A Wet Riser is a system of valves and pipework which are kept permanently charged with water. 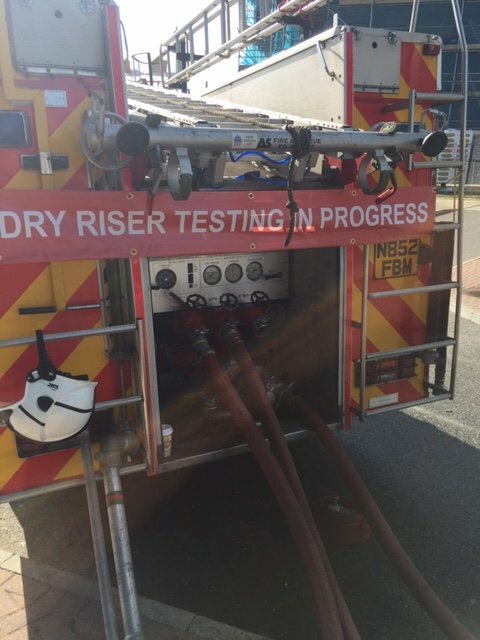 A dry riser enables the fire brigade to connect fire hoses to the dry riser inlet box and deliver water to the landing valves of the dry riser stack, which are situated on each floor. This saves critical time for the fire brigade. Dry Risers must have fire engine access within 18 metres of the dry riser inlet box. • A visual inspection every six months of the complete dry/wet riser system. • An annual Flow Test on the dry/wet riser system. Reasons why Dry Riser and Wet Riser should be tested. Risers are prone to neglect and vandalism. There are severe penalties should the rising main fail to work for the Fire Brigade. Our team of Dry and Wet Riser experts can design, install, test and maintain your Dry and Wet Riser Systems and ensure total compliance with BS 9990:2006/2015. It is essential that in the event of a fire you have the peace of mind that the Fire Brigade will have ready access to the water supply needed to contain and extinguish any fire. Failure to comply with BS 9990:2006/2015 can “NULLIFY YOUR INSURANCE”. Our team ensure that your dry risers and fire hydrants are in compliance with all relevant regulations.